I had never given much thought to histamine. I didn’t know what it was; I just assumed it was not good since an antihistamine relieves congestion and itchiness and all those uncomfortable allergy symptoms. Well, I just found out that histamine has a very important role in the body. Its primary job is to regulate the thirst mechanism. And, when there’s not enough water to go around in the body, histamine works to ration the available water. So, we don’t want to get rid of histamine. But why do some people seem to have too much? I learned from Water: For Health, for Healing, for Life: You’re Not Sick, You’re Thirsty!, by Dr. F. Batmanghelidj, that when the body is dehydrated, histamine production ramps up to produce emergency thirst signals. So, histamine isn’t the bad guy after all! It’s actually trying to tell us something very important: drink more water! In the lungs, this extra histamine can cause some trouble. The bronchial tubes, in their effort to conserve water, constrict. Lung tissue must be kept moist at all times, and normal breathing causes evaporation to occur. This is not a problem when we’re drinking plenty of water (half the body’s weight in ounces each day). But when the lung tissue becomes dehydrated, histamine comes to the rescue. It cuts down the rate of airflow through the lungs and it stimulates the production of thick mucus to plug the bronchioles. All of this is to PROTECT the body. But, my dear allergy-sufferer can testify, it doesn’t feel like protection when she can’t breathe. What if instead of an antihistamine, what she really needs is water? What if increasing her water intake brings her histamine levels back down to a normal level? What if she can relieve her uncomfortable symptoms without making another appointment or purchasing another product? I’m so excited about this possible solution for her problem! You know, it just occurred to me that antihistamine labels always recommend taking with large amounts of water. I didn’t understand why that was important before I realized the role of histamine. Now, I think of increased amounts of histamine as a warning signal. Just as we wouldn’t rush in to turn off a smoke detector without putting out the fire that triggered it, we don’t want to turn off the histamine signal without answering its call for more water. 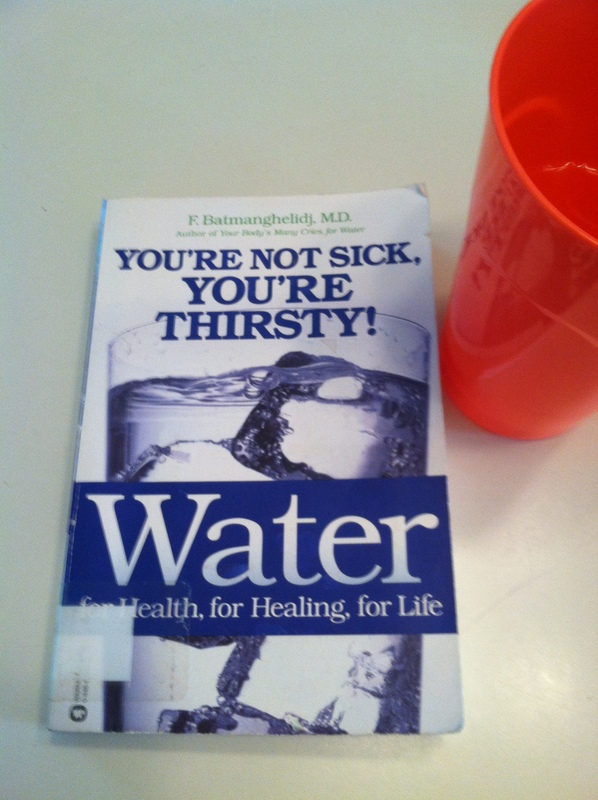 This post has been my attempt to condense what I’ve learned from Dr. Batmanghelidj’s Water: For Health, for Healing, for Life: You’re Not Sick, You’re Thirsty! If you’re dealing with allergies or asthma, you’ll probably want to read the book for yourself. Next time, I’ll share another exciting possibility for allergy sufferers. Until then, go pour yourself a big glass of water! Have you ever wondered why it matters if you drink water? Why not tea or orange juice or Gatorade? I mean, everything we drink is made from water, right? If you read The Water Cure earlier this week, you’ve probably figured out how many ounces of water you should drink each day. 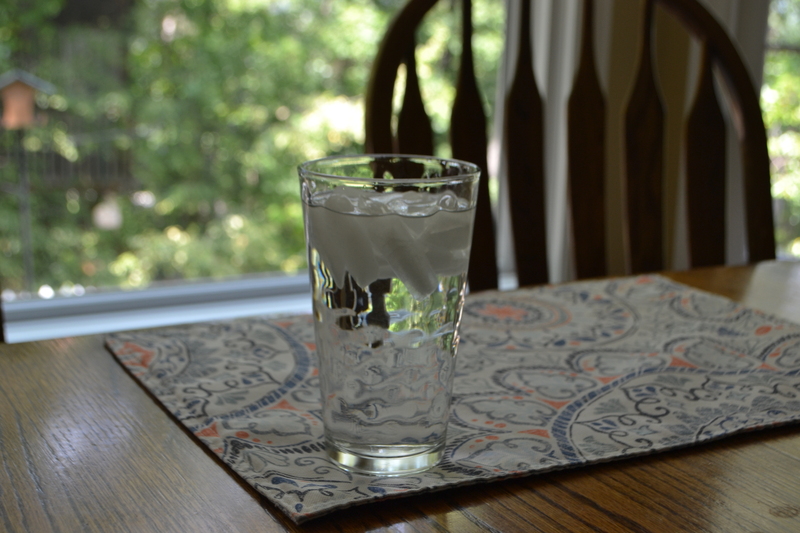 When I first realized that I needed to drink 65 ounces of water every day, my first thought was, “No way!” I started out sipping water throughout the day. I couldn’t get 65 ounces in before the end of the day, and I spent most of the day in the restroom. Then my daughter suggested drinking more at one time and that helped tremendously. I now drink 24 ounces when I first get up, another 18-24 between breakfast and lunch, and about 18 ounces between lunch and dinner. I also drink water with meals and before and during exercise. Drink water about 30 minutes before eating to prepare the digestive tract. This is especially helpful for people who tend to have heartburn or gas-producing indigestion. Drink water any time you’re thirsty, even during meals. Drink water 2 1/2 hours after eating to complete the process of digestion. Drink water when you first wake in the morning. The doctor also recommends taking a half teaspoon of salt every day, and there is a fascinating discussion of the role of salt, particularly unrefined sea salt, in the body. If you deal with hypertension, asthma, depression, or loss of bladder control, you will find the “hidden miracles” of salt in chapter 13 particularly interesting. I’m back with another glass of water and another excerpt from the very inspiring book, Water: For Health, for Healing, for Life: You’re Not Sick, You’re Thirsty! Today, I’d like to tell you about the Water Cure which is explained in chapter 12 of the book. The previous chapters discuss dehydration, thirst perceptions, and the effect of dehydration on every system of the body. Here are just a few of the facts Dr. Batmanghelidj discusses before his explanation of the Water Cure. In chapter 5, Dr. Batmanghelidj suggests conditions that represent indicators of dehydration. These include asthma, allergies, hypertension, constipation, type II diabetes, and autoimmune diseases. The following chapters explore these conditions as well as others and explain why dehydration is so devastating to the body. But don’t stop at devastation! So, how much do you weigh? 120 pounds? 200 pounds? Divide that number by 2 and determine to drink that many ounces of water today and the next day and the day after that… I’ll share some other suggestions in my next post.